The 2012 Dumbo Arts Festival will take place from September 28-30, 2012. Last year, over 225,000 guests attended the festival, experiencing works by more than 500 artists, 100 open studios, 50 galleries and stages, and 100 programming partners in Brooklyn’s most celebrated waterfront neighborhood. We dare you to watch this fantastic WABC-TV preview of the 2013 DUMBO Arts Festival and not want to put on your bubbles head down to the Brooklyn waterfront. Want some more? Check out the preview from NY1, which broadcast live from DUMBO this morning with arts reporter Stephanie Simon. PKPR secured major air-time for artists participating in this year’s Dumbo Arts Festival, the massive 3-day event featuring the works of over 500 artists. Check out this great preview segment by ABC Eyewitness News’ Lauren Glassberg as she speaks with artists John Lunceford and James Cospito about their Communilumin reed installation and Entasis Dance’s Eve Bailey about her performance. On-site at the festival, New York 1 News’ Adam Balkin was wowed by Codex Dynamics’ massive video projection presented on the archway of the Manhattan Bridge, Wildbytes’ Superhero installation, and Hindsight is 20/20 along the Brooklyn waterfront. Additionally, check out FOX New York where artist Matt Friedlander spoke about his 60 foot mural project at the Children’s Art Village. The 16th annual Dumbo Arts Festival took New York City by storm in September. The three day event boasted an eclectic schedule of works, performances, and exhibits by more than 500 artists. From huge projections across historic buildings and the Manhattan Bridge to interactive performances in Brooklyn Bridge Park to whimsical art floating on the East River and in the sky, festival goers experienced a free feast for the senses. PKPR made sure the crowds kept DUMBO packed all weekend by securing preview coverage in Time Out New York’s Best of the Fests, The New York Post’s Hot Picks, CBS New York, The Huffington Post, Fodor’s Travel Guides, Complex Magazine, The L Magazine and many more! No! It’s the Dumbo Arts Festival! New Yorkers will have the opportunity to experience what it’s like to have superpowers at this year’s Dumbo Arts Festival, taking place from September 28-30. Festival-goers will be able to fly across one of DUMBO’s landmark buildings, shift their shape and size, and throw light beams as part of Superhero, a large-scale outdoor experience that will be presented as the AT&T Signature Artwork at this year’s Festival. PKPR secured coverage of Superhero in outlets from The Huffington Post and New York Observer’s Betabeat to DNAinfo.com and The Brooklyn Daily. 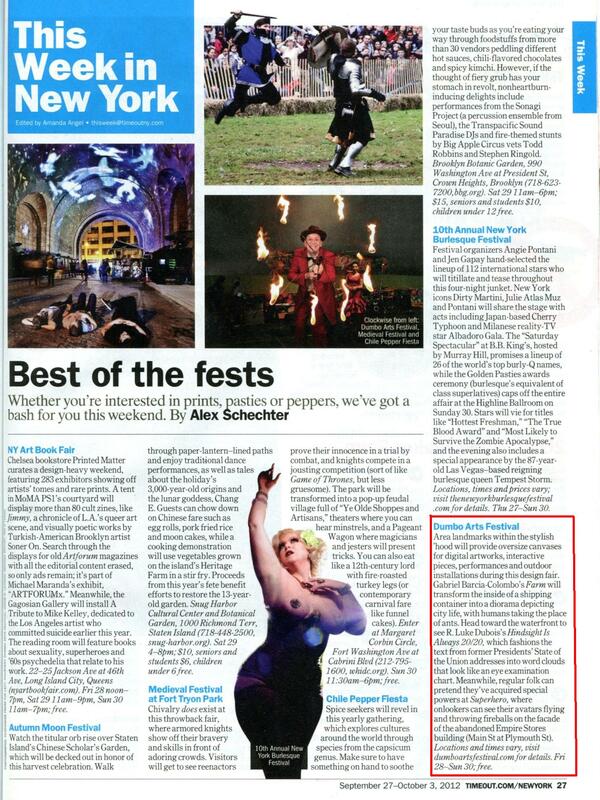 The Festival is also being highlighted as a top pick in many Fall Previews including Time Out New York, Time Out New York Kids, CBSNewYork, NYCGo and more!